At Metropolitan Vein and Aesthetic Center we pride ourselves on being able offer the best new hair loss solutions to all of our clients. In keeping with that mission we are pleased to be able to offer the NeoGraft Automated Hair Transplantation System as an option to consider when thinking about how you would like to handle your hair loss. The FDA-approved NeoGraft Automated Hair Transplantation System is one of the newest and most popular methods of hair restoration available. By using a method called Follicular Unit Extraction (FUE) patients who undergo the NeoGraft process are able to have their individual hair follicles removed in their natural groupings of 1-4 hairs and the placed in the parts of the scalp where balding has occurred. The result is natural looking hair that can be worn either short or long for both men and women. Both men and women can lose their hair as they get older. 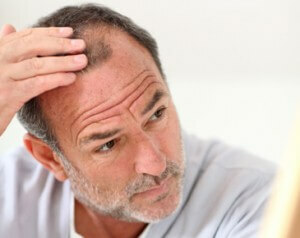 The most common reason for this hair loss is a disorder called pattern baldness – also known as androgenetic alopecia. Hormones combined with hereditary predispositions create a thinning hairline and pattern baldness. There are many health conditions, including thyroid disease and anemia that can cause hair loss. During your initial consultation with Dr. Adam Goldman, he will evaluate the cause of your hair loss and discuss possible treatment options with you. Many men and women will start to notice that their hair is getting thinner when they are in their 30s and 40s. Male-pattern baldness usually starts with a receding hairline and with the hair getting thinner at the crown of the head. Female-pattern baldness usually starts with the hair thinning on the top of the scalp. Metropolitan Vein and Aesthetic Center uses advanced NeoGraft follicular unit hair extraction to provide you with a more natural looking and permanent result. Each hair is carefully extracted and implanted in a way that duplicates the way hair naturally grows. The procedure will be performed in our office on an outpatient basis using local anesthesia. Most of our patients experience minor discomfort after the NeoGraft procedure. You may experience some itching and swelling, which is normal. You should be able to resume normal activities in just a few days. Scabbing should last about one week. The transplanted hair falls out about two weeks later, and the new hair begins to grow in again after about three months. Once the new hair has grown in, you can proceed with the next session. The extent of your hair loss and the areas you elect to fill in will determine how many sessions you will need. The transplanted hair lives and grows indefinitely. When the procedures are complete, no further treatments are required. You can style your hair like normal. A hair transplant offers permanent results. In the long run, this can save you money compared to other types of hair-loss treatments which are only temporary. To find out if NeoGraft is the right procedure for you, please contact our office today. Donor Hair RemovalFollicles are taken from the back of your head, an area that resists testosterone. Dissection of the Follicular UnitsThe NeoGraft procedure enables the surgeon to take grafts that are consistently the same size and length, which makes it possible to take a much greater number of grafts. Creation of the Recipient SitesBefore the surgery, the surgeon will create an individual plan for your hair graft that will give you the most natural-looking and attractive appearance. During the surgery, the surgeon follows the plan, which spells out the directions, angles, and orientations of the transplant recipient sites. Placement of the Hair GraftThe surgeon transplants each graft individually in order to give you the most natural-looking results. NeoGraft is a breakthrough for men and women who want a fuller and healthier head of hair using their own hair to restore their appearance. The NeoGraft process is simple and has many advantages, including a shorter recovery time and no linear scarring. You can enjoy having your own hair again.